Scenic Highway 30A parallels the Gulf of Mexico for 28 miles in South Walton County. Along Scenic 30A there are several small and unique communities and pristine sugar white beaches. Scenic 30A is also home to the rare fresh water coastal dune lakes that are located throughout multiple award winning Gulf front state parks. The Beaches of South Walton are an exciting and eclectic mix of architecture that matches each community’s charm. The area focuses on eco-tourism – promoting activities and events that allow everyone to enjoy the natural beauty of the area while building environmental and cultural awareness. Scenic 30A boasts unique restaurants and galleries, hot blues and jazz acts, and even a dueling piano bar. Most of the shops and restaurants along 30A are local family owned businesses. 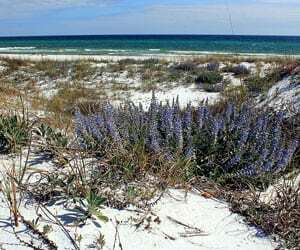 The Scenic Highway 30A area in serene South Walton includes the beach communities of Dune Allen Beach, Blue Mountain Beach, Grayton Beach, WaterColor, Seaside, Seagrove Beach, Watersound Beach, Seacrest Beach, Alys Beach and Rosemary Beach. There are many great local restaurants along 30A. Some of The Nathan Abbott Team’s favorites are Stinky’s Fish Camp at Dune Allen, AJ’s of Grayton Beach and The Red Bar in Grayton Beach, Wine World and Fish Out Of Water in WaterColor, and Restaurant Paradis in Rosemary Beach. Dune Allen features three coastal fresh water dune lakes, an abundance of walking trails, and several public beach accesses. This beach neighborhood has multistory single family homes on the Gulf and north of 30A, cozy beachside cottages, boutique shops, and variety of seafood restaurants. 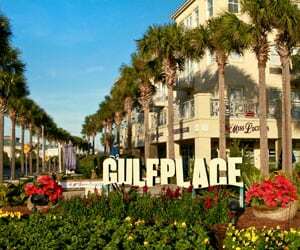 The Gulf Place community offers multiple mid to low-rise condominium buildings, townhomes and single family homes. Popular areas in Gulf Place are Artist at Gulf Place – a vibrant artist colony, three beach walkways and Gulf Place amphitheater. Gulf Place amenities include swimming pools, tennis courts, shopping and restaurants. Gulf Place is directly across from the Ed Walline Beach Access on 30A. Just south of Scenic 30A, Blue Mountain Beach offer peaceful seclusion and a small beach town feel. Properties in Blue Mountain Beach include condominium units, townhomes, ranch-style single family homes and large Gulf front homes. Blue Mountain Beach provides easy access to the cypress swamps and pine groves of Point Washington State Forest and the Timpoochee Trail. Grayton Beach is a laid back community with a small town feel. The heart of Grayton Beach features narrow neighborhood streets and old-style beach bungalows. Grayton Beach is the only beach in Northwest Florida where you can park on the beach and watch the sunset over the Gulf from your open trunk. 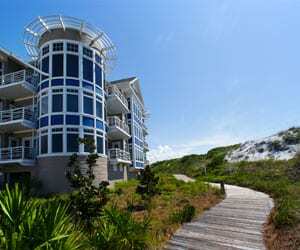 Condominiums and large homes are found Gulf front at Grayton Beach. 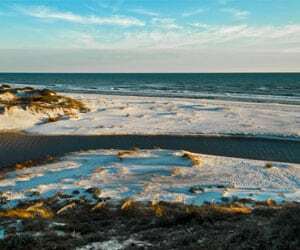 Home to the coastal ecosystems of Grayton Beach State Park and Western Lake, Grayton Beach is a favorite of fishermen, boaters and beachcombers. WaterColor Resort features a variety of properties including Gulf front condominiums, beach cottages, single family homes, large single-family homes and small residential communities. WaterColor blends award-winning restaurants and shops with 500 acres of nature preserve to create a perfect balance of natural attractions and modern amenities. Popular vacation destination community of Seaside was named the #1 Best Beaches on Earth for families by Travel + Leisure magazine. Seaside is a master-planned community designed on the principles of New Urbanism, where residents have all they need within walking distance. Seaside offers activities and services for everyone including six tennis courts staffed by a pro, three swimming pools, a world-class croquet lawn, a fitness center, catamaran rentals, nature walks, Camp Seaside for children, Beach Ready Spa, Seaside Repertory Theater, Kidz Beach-Surf-Skim Skool, a local grocery, and a variety of restaurants and shops. A mix of old beach homesteads, newer cottages and condominiums, Seagrove offers a variety of real estate opportunities. Seagrove features localy owned shops and restaurants that add to the old-beach small town feel. Named for the thick grove of windswept trees that surrounding the area, Seagrove has preserved the canopy of oaks, magnolias, hickories and sand pines that defined it a half a century ago. Located on the Gulf side of Scenic 30A, Watersound West Beach is a gated coastal community bordering Deer Lake State Park featuring single family homes with 3 to 5-bedrooms. Watersound West Beach amenities include a swimming pool area, outdoor grill and fireplace, puttering park, beautifully crafted boardwalks, parks, winding trails, natural area and dedicated beach access. 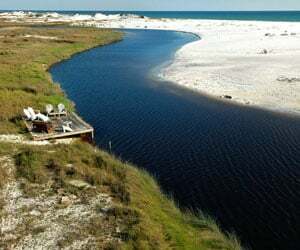 Watersound Origins is a 1,400 acre community bordering Lake Powell, one of Florida’s largest coastal dune lakes. Watersound Origins features single family homes ranging from 3 to 5-bedrooms. Amenities at Watersound Origins include community parks, walking trails, Origins Golf Club and golf course, Lake Powell dock, zero entry pool with large deck, events lawn and fitness center. 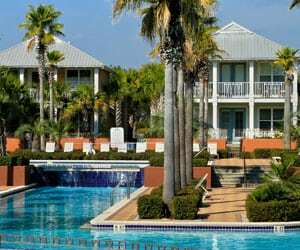 WaterSound Beach is a gated community with a variety of cottages, homes and upscale condominiums. WaterSound Beach is a combines the spirit of community with the seclusion of a gated beachfront. Watersound Beach community amenities include pedestrian bridges, boardwalks, swimming pool, landscaped parks, green spaces and a poolside restaurant. Seacrest Beach is a quite residential community offering an eclectic mix of classic Florida beach houses and brand new vacation homes. Located close to Camp Creek Lake and with very little commercial development, Seacrest visitors can truly enjoy nature while fishing, kayaking, swimming, golfing or sun bathing. Alys Beach is famous for its striking white architecture and offers luxurious single family homes, townhomes and undeveloped lots. Amenities at Alys Beach include a swimming pool, upscale restaurants, a community park and nature preserve. Alys Beach was carefully crafted with a focus on walkability, sustainability, and artistic detail. Rosemary Beach is a neo-traditional town located on the eastern end of Scenic 30A. Rosemary Beach features some of the finest homes in the area including luxury condominiums and multi-million dollar estates. Amenities in Rosemary Beach include a town center with shops and restaurants, tennis courts, pools, dune walkovers to the beach and abundance green areas. Topsail Hill Preserve State Park offers a wide variety of natural resources including 3.2 miles of secluded, white sand beaches, three rare coastal dune lakes, freshwater on-shore fishing, paved and natural walking trails, swimming pool, shuffleboard courts, camping spots and furnished bungalows. Grayton Beach State Park at nearly 2,000-acres features a boat ramp, Western Lake, nature trails, camping areas, a playground and private beach access. Deer Lake State Park, home to the coastal dune lake Deer Lake, offers beach access, fishing, hiking, picnicking and wildlife viewing. Deer Lake State Park has an abundance of natural plants, animals and coastal habitats. Camp Helen is bordered by the Gulf of Mexico on three sides, and by Lake Powell, one of the largest coastal dune lakes in Florida. The 180-acre park is for day use only. Activities include swimming, beach combing, nature study, hiking and both freshwater and saltwater fishing. If you are interested in purchasing real estate along Scenice Highway 30A, the Nathan Abbott Team is here to guide the way. Contact our Buyer Specialists at 850-812-3261 to schedule a consultation.